Independent agency CX Lavender has renewed its commitment to finding and nurturing the CX stars of the future with the launch of the 2019 Genus Graduate Program. Now in its fourth year, the graduate program offers permanent full-time positions and a generous starting salary to bright and ambitious graduates interested in a career in marketing and communications. The Genus Graduate Program is open to anyone who graduated from university in the past two years and is part of CX Lavender’s long-term commitment to growing its own talent through ongoing training and development. Unlike other industry graduate programs, Genus grads are fully-fledged, full-time staff members with designated clients, responsibilities and salary – with a guaranteed 10 per cent pay rise after six months of employment and a review for promotion at the 12-month mark. This year, CX Lavender is offering eight graduates the opportunity to work across different parts of the business, from account management to strategy, copywriting and design, as well as data and technology, in both its Sydney and Melbourne offices. Successful candidates are placed in roles that best reflect their specific skills, strengths and aspirations, with the flexibility to move into a different role if they feel it’s not the right fit. Tess Lavender, leader of the Genus Graduate Program, said: “As an agency that specialises in customer experience, we find that university courses don’t cater to that particular skill set. “So, we look for graduates with authentic personalities, deep ambition and vibrant ideas and we help them nurture the right skills, for now and for the future. 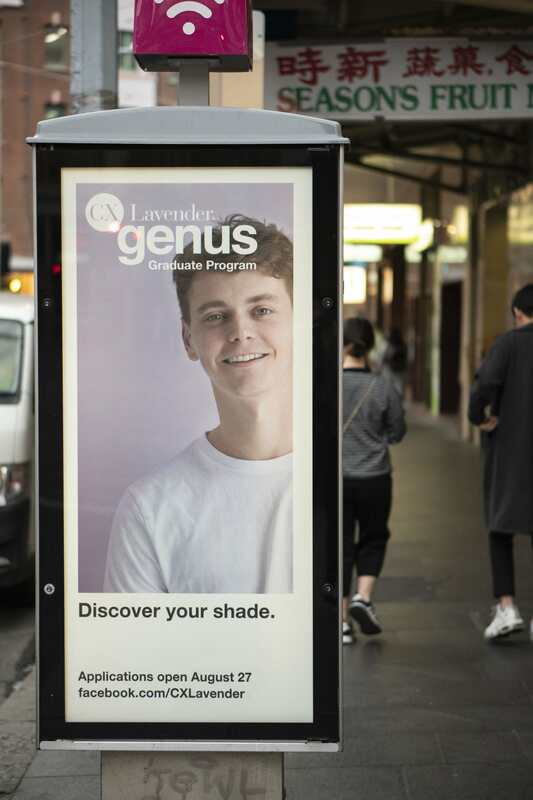 A university-focused campaign, including outdoor posters starring previous Genus grads, has been created to drive interested candidates to CX Lavender’s Genus Graduate Program website, where they can find out more and apply. The deadline for applications to this year’s Genus Graduate Program close on Thursday 27 September, with those successful to commence work at CX Lavender in January 2019.